Custom Enamel Badges you're bound to love. Quality guaranteed. Free design. Incredible service. Medals you can rely on! Your own unique design by our own medal design team. Wide range of ribbons and platings. Custom-made by the UK’s keyring experts! The home of custom-made cufflinks! Your own unique design by our own cufflink design team. Wide range of fittings and platings. Get your bespoke product designed by the UK’s leading custom-made product design team. Expert guidance - we’ve been making bespoke products for more than 30 years. Custom-made badges from the UK’s badge experts! When you work with us, you can look forward to the kind of service and expertise that only comes with supplying custom merchandise for more than 30 years. From the time you contact us, to the moment you receive your finished personalised merchandise, we’ll go above and beyond to make sure that you’re 100% happy with the service and products provided. We make creating the perfect company merchandise easy with our free design service, quality guarantee and incredible team of experts. Each of our account managers has been supplying custom pins, promotional keyrings and other branded products to the UK’s top companies for at least 10 years, so they know how to make your experience go as smoothly as possible. You’ll also have access to an experienced team of designers to help you come up with the perfect design for your product – all for free! We believe that great service isn’t something that you should have to pay more for. That’s why we offer the UK’s best prices – guaranteed – amongst quality certified ISO9001 companies. And as a socially responsible merch maker, you can rest assured that we have done everything we can to ensure you receive the best possible product without risking anyone’s human rights in the process. Learn more about our commitment to ethical manufacturing here. Make any pin brooch your own! 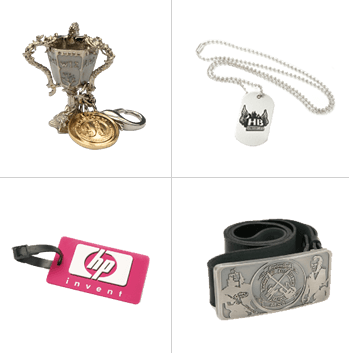 We offer an almost limitless variety of styles and designs – from custom lapel pins and corporate name badges to distinguished products for your school or awesome band merch. No matter how you plan to use your badges, we can help you create one that’s perfect for you! And when you choose us as your badge makers, you can be confident that you’ll receive a genuinely unique, high-quality product that’s ideal for promoting your logo, message or design. See our wide range of bespoke badge offerings here. Turn your brand or message into a personalised keyring that customers take with them everywhere they go. Choose from our handy trolley tokens, creative 3D keyrings or make a quirky statement with our playful rubber keyrings. Whatever you want to achieve, our highly experienced in-house designers can guide you throughout the entire process from initial concept right through to your choice of attachment options. See our range of customisable keyrings here. Enamel pins are a great way to showcase your company or designs and are available in either soft or hard enamel. Our soft enamel products are made by stamping your designs into your chosen plating before filling the gaps with coloured enamel, creating a thin line of raised metal. They’re a cost-effective and versatile option for any promotional campaign and very popular among artists. Alternatively, our hard enamel pins are filled with multiple layers of enamel, which is then polished back down to meet the metal plating. The result is a sleek, polished look that ideal for higher quality lapel pins and adds a touch of prestige to any campaign. See our best selling enamel pin badges here. Easily say ‘that’s a job well done’ with our bespoke medals! Our high-quality, branded medals are the perfect way to reward achievement or success. We have many years experience making custom medals that you’ll be proud to award, and which recipients will be honored to receive. We can manufacture your medals in any shape, size or finish that you wish to create a truly distinctive design. To enhance the special nature of your award, we also can help you create custom-made ribbons and bespoke packaging, providing a lifetime of brand visibility. See our custom medal options here. 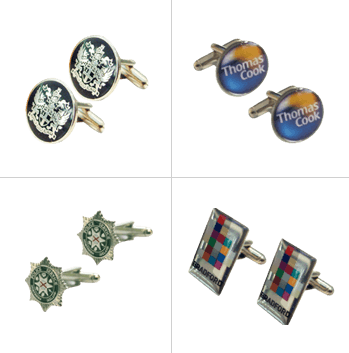 Add value and prestige to your brand with custom engraved cufflinks. We can your turn your logo into a beautiful piece of custom jewellery that can be gifted on its own or as part of a stunning gift set that recipients will treasure and use for years to come. Our cufflinks are made from only the highest-quality materials and can be manufactured to suit any brand or logo. And when displayed in our one of our bespoke presentation boxes, they become a truly valuable gift, award or retail item. See our custom cufflink options here. We love badges so much, that we named our company after them! But did you know that we also make many more branded products? As well as producing high-quality badges, we also manufacture a wide range of complimentary, related branded merchandise that can be made as part of a gift set or a standalone item. We’ve worked with an array of clients to create an endless variety of custom products, including belt buckles for Sony and Status Quo, tie-pins for BMI and Barclays and even custom brooches for the legendary fashion designer Paul Smith. We’re looking forward to seeing what we can create for you! See our range of other custom merchandise here. If you would like to get more information about any of our product offerings, or if you’re just not sure what type of custom badge or product will best fit your next promotional or fundraising campaign, the easiest way to get clarity is to get in touch. Send us an email through our contact page, or call on 0333 7000 132 and one of our local badge experts will be happy to put their many years of promotional merchandising experience to work for you!